I previously blogged about Colgate Enamel Health toothpaste when I first started using it about three weeks ago. I picked up the whitening version (it also comes in sensitive) at my local Walgreens using the gift card provided to me by Influence Central. 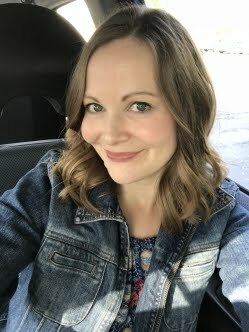 I'm here today to share an update with you! Since I drink two to three cups or more of coffee per day, I am concerned about whitening and the acidic affects of coffee on my enamel. I often don't feel as confident as I should because my teeth show a bit of yellowing from coffee and from the dental work I have had done in the past. Because I have had fillings in my front teeth, those areas attract plaque quite easily and only brushing and flossing my teeth usually gets rid of that build up. Since using the Colgate Enamel Health toothpaste, I have noticed that the plaque is not as prevalent there and that makes me so happy. I am hopeful that continual use of Colgate Enamel Health products will improve the front teeth especially, since those are areas people regularly see when they're talking to me or when I smile. After all, I know that I tend to notice a person's smile when I meet them for the first time or when I look at pictures. Your smile can communicate so much about you. Check out the video I made to fill you in on my experience with Colgate Enamel Health toothpaste. I also love to shop at Walgreens for beauty products. They have a great selection and I can always find the newest items that I read about in magazines or see on beauty blogs. When I was there recently, I noticed they had some great sales on things like lipsticks (hint: a lipstick with blue undertones tends to help make your teeth look more white) and skincare. Are you concerned about tooth enamel because you drink juice, eat acidic fruit, or drink coffee? Our final two nights in Colorado were spent in Denver. It's such a huge city with so many great things to check out, but we were getting pretty worn out at that point in the trip and had to focus on only doing a few small tourist attractions. On Tuesday, October 7th, we woke up early, had breakfast at the hotel and then headed to the Denver Museum of Nature and Science. I work in a museum and actually have my Masters degree in Museum Studies (I haven't talked about it on the blog much). So, visiting a museum reminds me of work, but I also get to be inspired by how another institution creates their exhibits, programs and technology. This is the view from the museum--gorgeous Denver skyline in the background. Of course the museum featured lots of gold! My favorite exhibit was the health one. I could have spent all day in there since I am a total health and wellness geek. So cool that the exhibit analyzed the way you walk and showed a shadow of you. I wish we had this lab at the museum I work at! After the museum, we got some coffee, walked around a Barnes and Noble and then headed out of the city to eat lunch at Illegal Pete's. It featured a great menu with lots of options! I liked my vegetarian tacos and Craig enjoyed his burrito. 'Twas a great last day in Colorado! I look forward to going back to Denver someday and exploring it more. 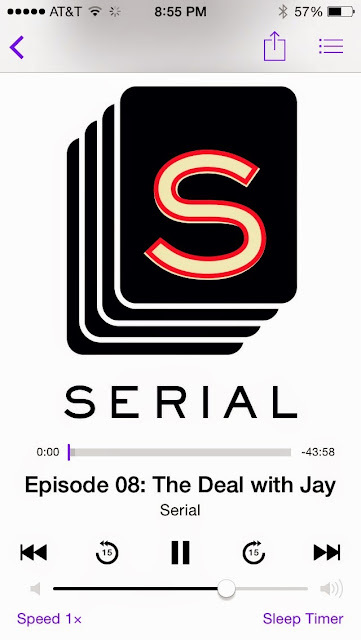 Serial Podcast Anyone else obsessed with Serial? I wasn't sure I'd get that into it when I first started listening, but I think I should have been a detective because I love mysteries and trying to put clues together, like the host Sarah Koenig is doing in each episode. It comes out every Thursday and I so look forward to listening to a new episode on my way to work. I've been discussing it with my colleagues who are also hooked. One of them is even more obsessed than I am with it! 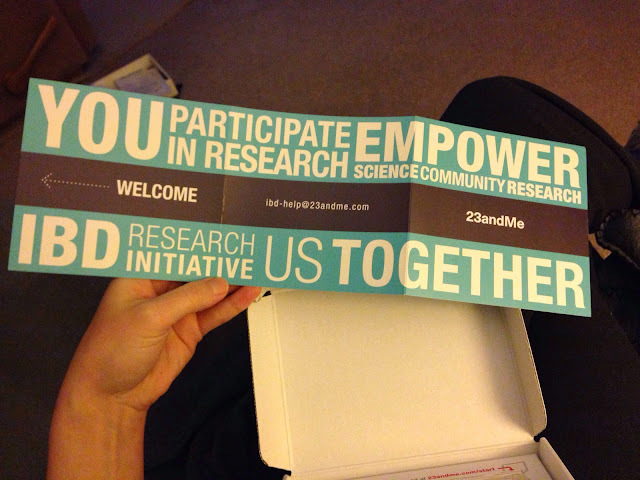 23andMe The same colleague that is obsessed with Serial also got her 23andMe test back recently with percentages of her ethnicities outlined. I love genealogy and I was pretty much ready to pay the $99 to get the test done when I heard it was now that cheap. I started doing some research on twitter about the health aspect of the test (which will be approved by the FDA soon I hope). Somehow I stumbled upon a tweet that mentioned if you have Irritable Bowel Disease (IBD), you could get the test for free and contribute to IBD research. I signed up immediately and literally was dancing with excitement in my kitchen. Yes, total nerd here. My sample ready to be sent! I cannot wait to get my results back in 6-8 weeks. 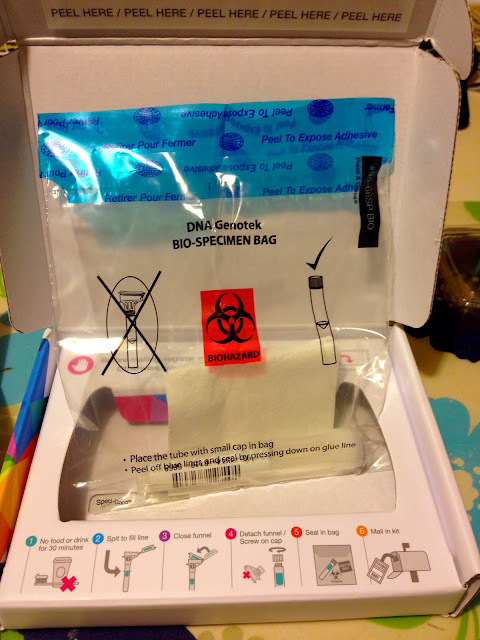 I am really hoping they get processed before Christmas so I can show the genetic percentages to my siblings and parents. 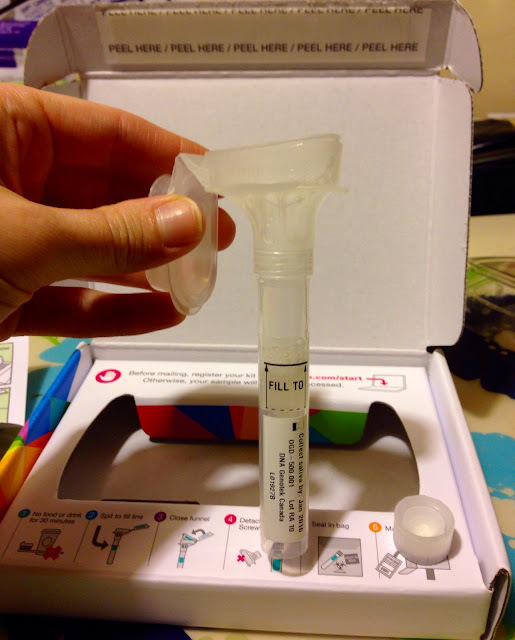 Obviously, I am also excited to contribute to IBD research with this test as well. I told three of my family members who also have Ulcerative Colitis about it and urged them to sign up. Finding Your Roots show on PBS I don't watch a whole lot of TV, but when I find a show I love, I get addicted. 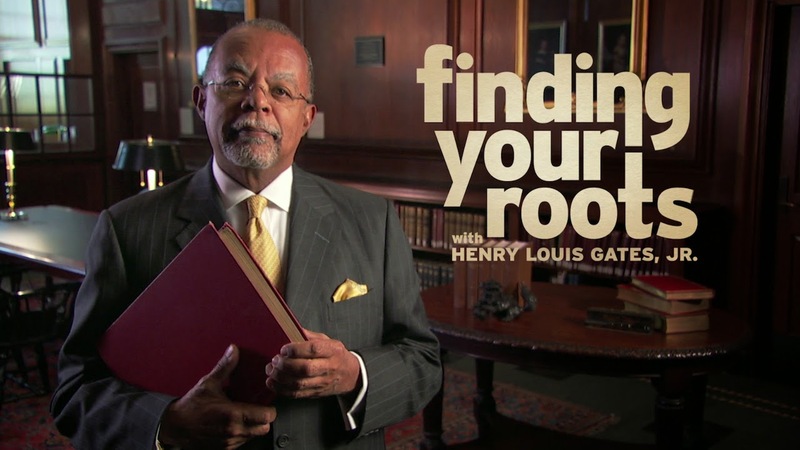 I am currently loving Henry Louis Gates, Jr.'s PBS show about celebrities' family histories and genealogy. I am getting inspired to log onto Ancestry.com and do more research on sides of my family that are still a mystery to me. I just wish I was fortunate enough to have researchers in Norway, Germany, Austria and Denmark to find more information on those sides of my family that I know so little about. 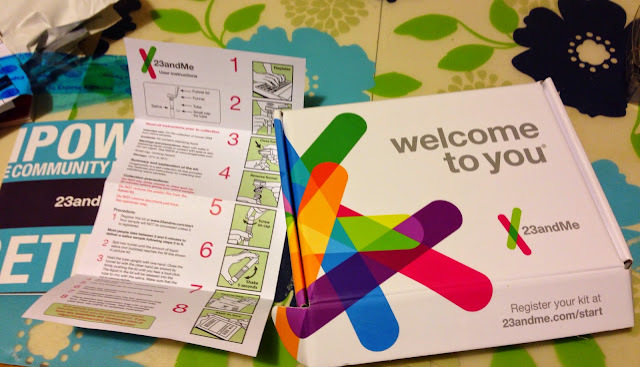 Maybe my 23andMe test will be helpful, as the DNA test is for celebrities on the show. My husband's latest obsession? Researching the Amazon Echo and watching funny parodies about it. Someone really wants Santa to bring him one, that's for sure. Sunday, October 5th: We dedicated much of the day to hiking in Rocky Mountain National Park. We picked two trails to check out, Bear Lake and Emerald Lake. The weather was quite frigid, so as you can tell from this photo below, we layered up quite a bit. I was toasty as we started walking, but the wind really pummeled us at times. A sweet couple from Green Bay, Wisconsin took this picture of us and we took one of them! Our first hike was so easy and just a good warm-up for the more challenging one that followed. It was a mere half mile walk around Bear Lake, on pretty flat trails. The lake was picturesque and so were the mountains, of course. After eating a few more snacks and warming up in the car, we got ready for a longer hike up the mountain. Craig at Nymph Lake, the first of many bodies of water we passed on our hike to Emerald Lake. After Nymph Lake, we started getting into hillier terrain and spotted many small waterfalls. Dream Lake was the last one we passed by before our final destination. The trails were challenging, yet really enjoyable. I felt like I could have hiked all day at this point. Total endorphin high! Once at Emerald Lake, we were treated to this gorgeous view. Craig rested with a new friend, who wanted to share his snack with him. There were chipmunks everywhere. This one even climbed on Craig's back! I fueled up with peanut butter crackers and this delicious Mamma Chia squeeze I purchased specifically for hiking. The hike back was much easier than the hike in! Much of the trail looked like this, with logs to walk up, so it was a challenging 5.5 miles round trip. We really enjoyed our hikes around Bear Lake and to Emerald Lake. I'd recommend the second one if you're an intermediate hiker. I was thankful for my Merrell hiking boots because there were many opportunities for me to turn my ankles. Total miles hiked: almost 6. Yes, I am still blogging about Colorado. I am nearing the point where I am starting to forget what we did every day, but the pictures remind me of the details. Before I forget about what we did each day, I better continue to crank these posts out, more for our sake and preserving the memories than anything. Perhaps these posts will be useful to future travelers of these areas though! On Saturday, October 4th, we enjoyed a lovely breakfast at our hotel and then walked around a very quiet Manitou Springs one last time. 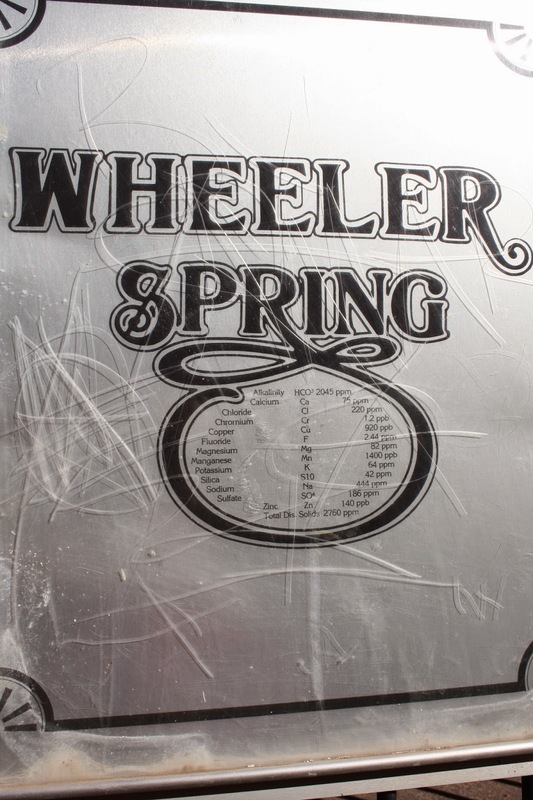 We both felt the need to try the water from a spring, so we filled up three water bottles with the Wheeler Spring water near our hotel. Neither one of us tried the water, we just presumed it was great. On our car ride later that day, Craig took a sip of water and spit it back out. I tried a sip and did the same thing. I guess some of the springs are better than others. Craig's Aunt said that she loves the water from Manitou Springs, but only from specific ones. We said goodbye to Manitou Springs and drove three hours north, through Denver's traffic jams, through Lyons and on the windy roads to Estes Park. Craig was not fond of the curvy mountain roads at all, so it was a relief to get to flatter land and find our hotel. We tried to check in early to get rid of our luggage, but had no luck. So, we headed to another hotel, the Stanley. Having just watched The Shining before our trip, we both wanted to see the hotel that Stephen King wrote the story in. I think many tourists assumed the movie was filmed there, but that's not true. We enjoyed walking around the inside of the lobby and taking pictures on the grounds. After the Stanley, we drove through a very crowded Estes Park downtown area. There was an elk festival going on, so people were everywhere. The restaurants and shops in town didn't really appeal to us. The areas off of the busy main street were pretty though. Both of us weren't impressed by the reviews on TripAdvisor of many downtown restaurants. We found a pizza place about a mile down the road and walked there instead. The restaurant, Cheesy Lee's, was in the Elk Horn Lodge. Totally weird name, but the pizza was decent. Naturally, there were elk walking around right outside the lodge and restaurant. The lodge was historic and creepy. It was exactly what Craig wanted to see on our trip. Teddy Roosevelt had stayed there at one time and so had Stanley, while his hotel was being built. Craig spotted this sign in the restaurant and was intrigued by the fact there could be ghosts there. He spoke to our young waiter, Tristan, about it and Tristan wouldn't shut up about the ghosts he had seen and spooky things that he had personally witnessed. Before we knew it, we were sold on coming back at 8 p.m. that night for a ghost tour with Tristan, who ran his own ghost tour business on the side. I actually was quite nervous about it all, but Craig was so excited. After lunch, we went back to our hotel to finally check-in and take a nap. The views from our room were amazing! Before our ghost tour, we drove to Rocky Mountain Park and purchased our $20 pass for the next two days. We were greeted by huge elk at the entrance, some running literally two feet in front of the car! It was mating season, so strange noises were coming out of the animals and they were everywhere! We didn't get too far into the park, just enough to see a moose in the woods that had crowds watching it. On our way to the Elk Horn Lodge, we were treated to this gorgeous sky. Once at the lodge, we hung out in the spooky lobby and waited for our tour to start. The tour was ok--Craig loved it, but I was freaked out much of the time. We didn't see any ghosts or experience anything that strange. Tristan told us lots of interesting stories though. At the end of the tour, we ended up in this weird area with a teddy bear that had a ghost detector built in and it made some noises off and on. I was not really in the mood to see a little 8 year old girl ghost that we heard tales of, so I am glad nothing happened! Later that night, we just planned out our hikes for the next day and prepared the food we were going to bring to keep us fueled all day. It was a good first day in Estes Park filled with many adventures I didn't anticipate! I am hoping to stay fit this winter and keep the winter weight off. Thanks to the folks at EatSmart, I received their Precision CalPal Digital Scale to review and keep me in check. 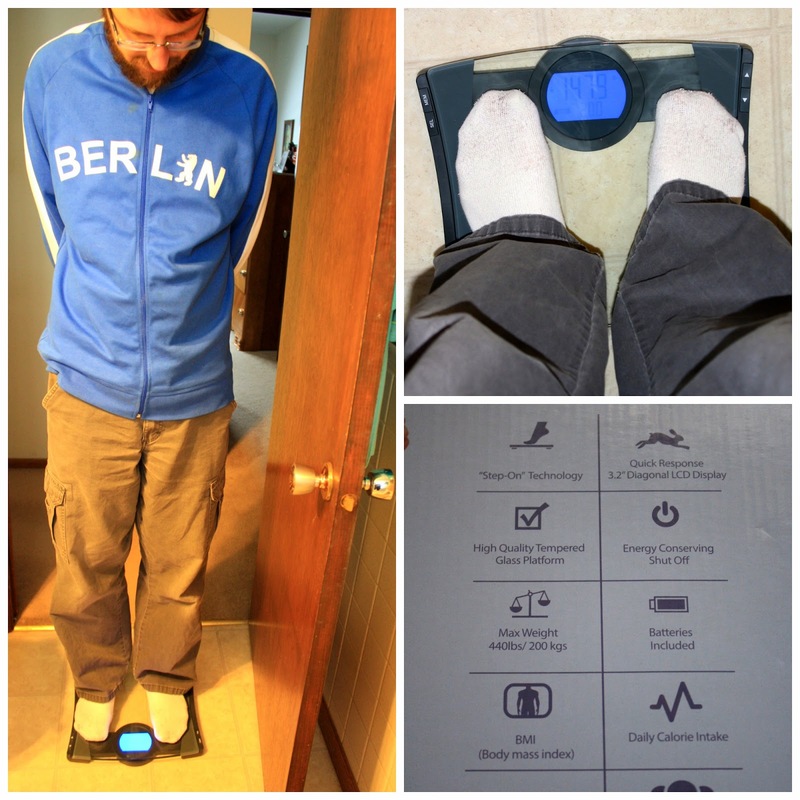 Before receiving the scale, I did not tend to weigh myself that often, unless I was curious about my pants feeling loose or something. I recently did lose some weight, I believe due to going off of a medication, so I want to stay at this happy number and use this product to ensure I am doing that. Automatic User Identification Technology - CalPal immediately identifies the user based on past weights. Auto Calibrated; Auto Power-Off; Runs on 3 AAA batteries (included); 100% EatSmart Satisfaction Guarantee - Buy with Confidence! My favorite features are that it calculates your BMI (Body Mass Index) and daily caloric intake number. It's amazing how even a few pounds of weight loss can make that BMI number decrease! I had Craig model for me and he wasn't shy about sharing his weight (147.9) with the rest of the world, where I like to keep that sort of thing private! I like that we have two different profiles created for us and stored in the scale with our height, age and gender. 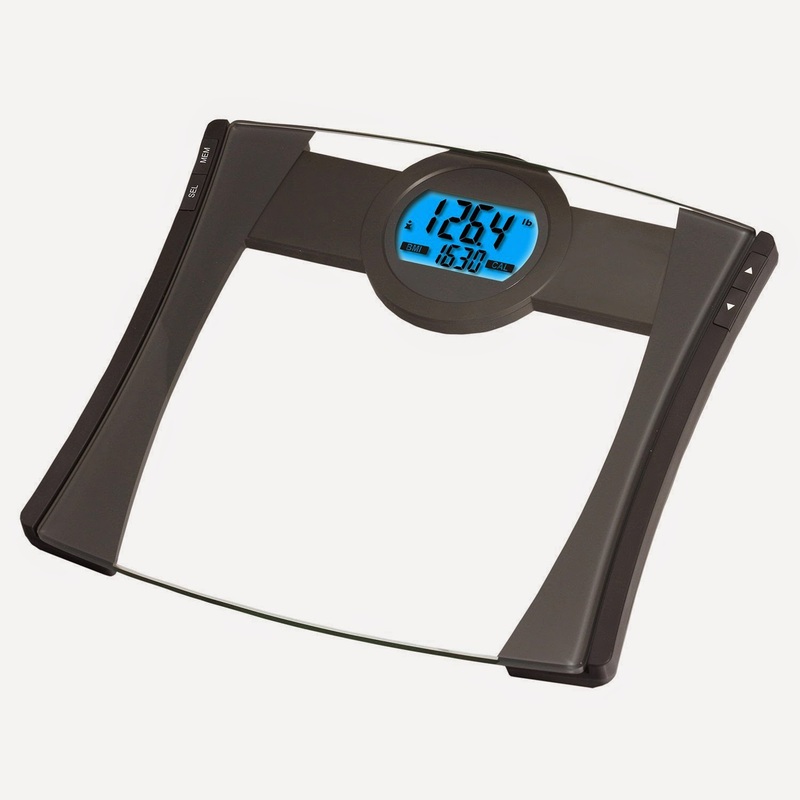 I would highly recommend this scale if you're looking for a new digital one that is very easy to use. It retails for $35 on Amazon. Thank you for providing this scale for me to review, EatSmart! Disclaimer: I received the product above in exchange for an honest review on my blog and Amazon.com.